Chaetodon auriga Forsskal 1775, the Threadfin Butterflyfish. A great beauty and hardy aquarium specimen, though it will eat coral polyps and anemones. Thank you very much For your prompt reply Mr. Fenner. Will keep my fingers crossed that I will be able to find these 2 species of Butterflyfish. I just have a follow up question about the Tinkeri .... is this fish better kept as a single specimen or as a small group of like 3? Thank you very much Mr. Fenner. Will update you. The Heniochus are the fish I really want to put in. I actually didn't think I could put a pair of golden butterfly fish in as well, they're a favourite of mine so that's a bonus, but I'm thinking of putting a yellow tang and a fox face rabbit fish in the tank as well as the 3 or 4 butterfly fish. Would this be ok or would I have to rethink my stocking list? Sorry for all the questions Eric, but I appreciate your help. No worries on the late reply mate you've been very helpful and I’ll take your advice. I got a magnificent fox face yesterday it's the first I've seen one here in Ireland so I snapped him up. So I’ll wait at least a month then I’ll add the butterfly fish and I’ll take things from there. It's been close to 2 months now and my green mandarin has been doing great! He has no interest when I feed the other fish, but definitely is getting plenty of pods to keep his belly full and has grown since I got him. He is most active around "dusk" when the lights are low and the pods begin to come out more. I have seen no visible evidence of pod populations waning since I added the mandarin. The other fish seem to completely ignore the mandarin and let him do his thing. I really enjoy the mandarin, so thanks again for your encouragement! Next question. I am considering trading my one-spot Foxface for a coral, which would open up some room to add another fish. I'd really love to add a butterfly fish, though realize they can be a challenge in a reef setting and ideally they would should be added as one of the first fish rather than last. The leading candidates I'm considering are the Longnose butterfly and Chelmon marginalis. From the research I've done the Longnose would be the safer bet. These are my concerns that I wanted to get your thoughts on (plus anything else I'm not considering). I also realize that fish vary from individual to individual, so there are no guarantees. (I have some open space for one in a back corner), so that would be another factor. 4) Would the butterfly make a big dent on the pod population, outcompeting the mandarin for food? If the butterfly wouldn't make a good choice, my next choice would be another Halichoeres wrasse. Hi, Do any of you guys and girls know why in the trade you never see small, say 3 or 4 cm.s Yellow Longnose or Copperband Butterflyfish? I have never seen them diving also? Regards, Adam. I am in the early stages of a FOWRL build. Planning on a 180 gallon, but don't have the equipment picked out yet. I am going to build this around two specimens, a snowflake and H tusk fish. I have been considering a tang and butterfly mix. I am familiar with the species except butterflies. I don't have any particular species picked because I wasn't sure about the mix. What do you think? Also, are there any corals that will survive butterflies? Mushrooms or green star polyps maybe? Anything to add a little life to the live rock. ... My top three choices are raccoons, threadfins, Heniochus acuminatus. I am planning a 240 gallon fowlr tank. I am planning my fish selections around a harlequin tusk, snowflake eel, and possible a porky. Are there any butterfly's that can coexist with these tankmates? The skimmer that I plan to use has yet to be picked, but it will be very aggressive. I'm trying to identify a butterfly fish that I have purchased from local fish store. It says assorted Atlantic butterfly but couldn't find out any more information on it. I browsed your site but couldn't find anything on it either however did see the picture on your butterfly fish section. Can someone help me identify this fish for me please? Yea, this was an impulse buy and I'm not too proud of it. However to justify for it, I couldn't figure it out on the store because they didn't know the name of the fish as well. (usually I'm tapping on my smart phone researching in the store haha) It has been there close to 3 weeks and was eating brine shrimps well when was fed and at the price tag of $7.99, I couldn't resist this beauty. I knew that butterflies are hard to take care of but looking at the article in your site and your recommendation, it looks like it's REALLY difficult. There is no way I can take back the fish. Any personal recommendation that you can give me to take care of this finicky fish, I would appreciate it. <Your above food recipe is good. Might want to paste this mixture on a Brain Coral (or similar) skeleton. Although Brine Shrimp isn't all that nutritious, soaking it with a few drops of Selcon is advantageous as long as it still eats the Brine Shrimp. I also suggest feeding small amounts three or four times daily. Might want to look through our FAQs on Butterfly Fish feeding for more ideas/suggestions. 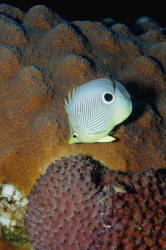 I have recently read with interest on the WetWebMedia website your articles on Butterflyfishes. I am keen to add a Butterflyfish to my Aquarium but have yet to decide what, if any, would be best suited to the environment I am able to provide ? For information, my current live rock and miracle mud based system has been up and running for just over 2 years and consists of a 6x2x2 aquarium (plus sump) with 2 centrally arranged coral 'bommies' for max. swimming space with lots of Tunze stream flow and 3x250w 14,000k halide lighting. Fish population is 5 x Chromis atripectoralis, 1 pair of Amphiprion Percula, Centropyge Bispinosus & Eibli, 1 Labroides Dimidiatus and 1 Naso brevirostris, 1 Zebrasoma Desjardini, 1 Acanthurus Leucosternon and 1 Acanthurus bariene. With my set-up, I have tried to mirror my own experiences of the Indian Ocean, especially the waters around the Maldives (where I went on a holiday just last November) and the pictures I was able to take whilst snorkeling there on both the Honeymoon and Holiday - with the obvious exception of the Coral beauty dwarf angelfish ! and perhaps the Eibli angel too !! This has led me to the subject of the Butterflyfish for my own aquarium, I am particularly drawn to Hemitaurichthys Zoster and would love to add a pair, but in 4 years of marine fish keeping I think I have seen them available for sale on just one occasion !!!! So I have looked through my underwater photos and have identified the following species that are more readily available from my local retailer (Oasis, Manchester). These are Forcipiger Longirostris, Chaetodon Collare and Chaetodon Auriga and I would be particularly grateful if you would impart some of your knowledge and experience with the family Chaetodontidae and be able to offer any advice on my chances of successfully maintaining any 1 or 2 of these Butterflyfish in my own aquarium set-up and what, if any, fish / coral husbandry issues I would have to consider or would likely be expected to encounter. The messages in the industry seem to be so very mixed with retailers seeing the addition of almost any Butterflyfish into a reef as a big no no !!! but species experts such as yourself offering hope to those aquarists who harbour thoughts and dreams of keeping these fishes successfully in our reef aquariums. I am sure you are inundated with such questions from confused aquarists like me but any advice based upon your own experiences would be very much appreciated indeed. I've been enjoying your site for some time now, and I appreciate all the help you give to us in the hobby. with several Actinodiscus, a Ricordea, two Sarcophyton and a Fungia in my 125. So now to the hard part. I would like the new tank to contain two or three additional Chaetodon, depending on ultimate size, and one large angel as well as a Naso lituratus. My goal is to find species that will leave the mushrooms alone. I can always find a home for the Fungia if I need to. I am interested in adding any of the following Chaetodon: falcula, semilarvatus, melannotus, ulietensis, or collare. For the angels, either a Pomacanthus annularis, imperator, or semicirculatus, or a Holocanthus. It's been very difficult finding the few cnidarians that would be unmolested by such a varied group, and being only able to choose a total of three or four fish, I want to make the right choice the first time. something in between; that is a non reef safe tank, with a few non palatable cnidarians and crustaceans. Any further suggestions? Thanks! Hi there Bob. I have learned much from your book, the photos are fantastic, as well. I have a question on the disease resistance nature of two species you place high on the list of suitable aquarium inhabitants. In one write up on Golden Butterflies, and in a few questions from readers, you state they usually come in pretty clean, and would really only recommend a dip before placing directly in the display, skipping the QT for these. However, I followed a link you posted to a reader that gave an updated version for the care of these butterflies, and in that article you'd stated they are quite susceptible to Ich and velvet. Perhaps I interpreted your statement incorrectly? do not point this out to show a contradiction, for I don't believe there is one...only to receive clarification on the disease prone nature of the Golden Butterfly. like a damsel or a Mac Angel? Your approval of them had me put a pair on hold at my LFS. but I'd love to hear from you which of the two species you'd recommend on just that one factor alone. Greeting Bob, thank you for taking the time to explain, it is very clear now. 2 notches down from a Mac is great! I'll get a pair of both the Goldens and the Banners. Thanks again. Also. I live in San Diego. I saw a news report a couple of months back regarding the canyon fire issues a little further north of me. There was a resident named Robert Fenner featured. He was in his backyard explaining how he'd planted all of these ice plants as a safety barrier to the annual canyon fires and the city wanted him to rip it all out just because he didn't have city permission to plant them, even though it was on his own property! (go figure)...He was shown sitting at a large dining table inside his home as well as out on his wooden deck overlooking an incredible valley view. Was that you? Re: Butterflyfish aquarium 3/9/08 Thank you for your quick reply! On my list which one would you consider to be the most difficult? <Mmm, the Saddleback... with the Raffle's and Collare as individuals (better in groups) not far behind> Also, which one would you replace if I were to add the flavissimus (Long Nose)? <Umm, the above...> Lastly, why would you add the raccoon butterfly last? Thank you once again! <Mmm, I would not... whoever answered you previously (not included below) might have other input. 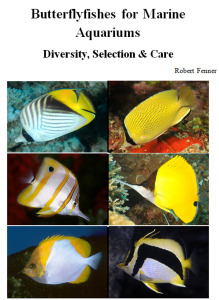 Please read the accounts of these species posted on WWM... MUCH useful information re archived there... Bob Fenner> WetWebMedia Crew <crew@wetwebmedia.com> wrote: Butterfly Fish Systems/Compatibility 3/7/08 Hello, I have a standard 180 gallon aquarium, 72x24x24. I wanted to make this a butterfly isotope. I would like to keep one: Chaetodon auriga, Chaetodon collare, Chaetodon ephippium, Chaetodon falcula, Chaetodon fasciatus, Chaetodon rafflesi. I calculated 1 inch per 4 gallons. Am I overcrowding the aquarium? Do I have extra room for any other possible butterflies? Are all these butterflies relatively hardy? In order, how would you add the butterflies into the aquarium? Lastly, are all theses butterflies compatible with each other? http://www.wetwebmedia.com/poorchaetodons.htm http://www.wetwebmedia.com/BFsBestWrst.htm Thank you and I love your website!! Milletseed butterfly 8/24/06 Hi < Howdy! > Had a question about adding one last fish to my 75 gal w/: prism skimmer magnum 350 50 pds live rock and base Seio 620 3 Hagen 270 gph pw's 1 yellow tang 1 clarkii clown 1 purple pseudo 1 bi color blenny 1 coral beauty dwarf angel various mushrooms and polyps ph 8.2 nitrates 20-40 nitrites 0 ammonia 0 I bought a millet seed/lemon butterfly that can get up to 5 inches. < This is not a wise choice for the average reef tank. > This fish is in my qt for 2 weeks now. < I love to read/hear about people practicing this. Brilliant! > Should I add it to my tank or take it back to the LFS, b/c my tank will be overstocked with it? <Regardless of the probability of already being somewhat well stocked before the addition of the butterfly, there is a more serious question at hand: Do you have strong enough feelings for the fish to look past his affinity for your corals? There are some fish I would gladly place in a tank of corals and let them eat to their heart's content. Is this that fish for you? Invariably the butterfly will pick on some of your corals, and for some inexplicable reason, it will choose your favorite Cnidarian to snack on first! So, I again ask, is your love for this fish greater than that of your coral? > Also are my nitrates too high for this hardy butterfly fish. < The nitrates are not too high, but they do point to either an inadequacy in filtration or maintenance. Good luck in your decision making. RichardB > Thank you very much!! Butterfly Selection Hello again, <Hi, Ryan Bowen with you> my husband and I have put to use most if not all of the info this crew has given us and things are coming along beautifully, thanks again. <Sure! Great to hear of your success.> We recently purchased a 100g. acrylic tank with an over flow box. So far it has been stocked with 20 to 30 lbs of LR from our well established 50g. that recently cracked down the back. It was a very old tank. <I see!> The water in the 50 had just gone through a water change so we placed all of the water in to the new 100 as well as 50 gallons from our established 125 gal. In the overflow box we placed most of the bio balls that we had removed from our 125g.that same day. We finally replaced it with LR rubble. We will soon replace the same bio balls in the 100g with LR rubble as well. As of right now it has no SB but soon will have 2 - 3 " taken from our 55g. sump/fuge, again well established. Since everything in the tank came from established systems ( 1 year plus ) would that cut down the cycling time? <Oh yes. Considerably. Wait until nitrates are zero, and then stock.> or should we still wait and treat it as if everything was brand new? It is already filled with pods, 1 Cerith snail, two larger snails I need to ID, and 4 fire shrimp from the old 50 gal. It was a middle of the night tank swap. Since our 125 is a reef with fish we wanted a nice FO display. <Nice to break it up a bit.> It will soon have a sump/fuge as well. So far the fish we like have been narrowed down to these few: Longnose BF, Raccoon or Red Sea Raccoon BF, Threadfin BF, Flame Angel, Fire Fish or Pearly Jawfish, Neon Goby and of course our Fire Shrimp refugees. We have read conflicting info on whether or not these fish can or should be kept in pairs or not, except for the flame angel and fire fish, "There can be only one". The same goes for whether or not the BF's listed above should be in the same tank together. <In a one hundred gallon tank, you can certainly have a pair of Firefish. The flame angel is best alone, as he'll bicker with anything similar. The butterflies are the toughest choices! I'm a big fan of the Long Nosed Butterfly, and they're peaceful enough to live in harmony with each other. Jawfish are best left to tanks with deeper substrate. Threadfin Butterfly is a great choice, I'd recommend it second only to the Longnose. Good luck, Ryan> Any help is always appreciated, thanks Shauna. Copperband Suitability Hello, all. Thanks, as always, for a great site. <Mornin. We're here to help.> I have a question about my all-time favorite fish - the Copperband Butterfly. I have a 75 gallon reef tank with a small upstream refugium. I had originally written off the Copperband because I thought it would pose too great a risk to my corals and my clam. I've poured through your FAQs, and I've noticed that most of them say that Copperband doesn't pose that much of a risk. <As far as Butterflies go the Copperbands are more likely to behave themselves.> I also have a growing Aiptasia problem, so the risk of the Copperband might be better than the risk of the Aiptasia getting out of control. Here's what I have in my tank: 1 Hippo Tang 1 Scott's Velvet Wrasse 2 Ocellaris Clowns 3 Firefish Gobies 1 Skunk Cleaner Shrimp 1 Peppermint Shrimp (I've had him for 5 days. No interest in the Aiptasia so far, but probably too soon to tell.) <probably.> 1 Bubble-tip Anemone 1 Colt Coral 1 Sun Coral 1 Wellsophyllia 1 Anthelia (small cluster) 6 Acropora (mostly small fragments, all growing well) 1 Maxima clam ...plus lots of live rock and a 3" sand bed. My water parameters are all good -- 0 ammonia, 0 nitrites, < 10 nitrates, 410 calcium, 9.6 dKH. I have a small amount of experience with the Copperband. Years ago I had a FOWLR tank in which I had a small Copperband. I was able to keep it for a while and get it to eat, but then a damsel fish decided to kill it. <ouch!> So my question is, do you think it's safe for me to get a Copperband? If the answer is no, please let me down easy! :-) <Well Patrick, we need to talk.... It's not you, its me. Ha, just kidding. The tang and the clowns may be a little to feisty for the Copperband, IMO. Check out the links below before making any final decisions. Best Regards, Gage http://wetwebmedia.com/chelmon.htm http://www.wetwebmedia.com/chelmonfaqs.htm http://wetwebmedia.com/BFsBestWrst.htm > Thanks!